Before I get into the newsletter for the club, I have to say thank you to the LGA, Bandits and all the participants we had in events throughout the season. I have truly enjoyed this entire season and I look forward to continued growth as we continue in to the future together. I am continuing to expand on the knowledge I have as the season slows down. I have plans to go to Orlando in January and South Carolina in February to participate in seminars with industry leaders and top teachers so I may better serve our membership. I am really looking forward to these opportunities as I will be learning from individuals such as Andrew Rice, Martin Chuck, and Joe Mayo among other top teachers I have been following for over a year. I will also be taking a good look at the programs we ran this year for player development. I hope to have even more options available to help you play your best in 2016. As September gives way to October we begin to feel as though the season is coming to a close, but I want to remind everyone that there are still a few golf events and several social events for you to enjoy. Even if the weather is than conducive for golf, we have some awesome opportunities for savings on in stock merchandise. These are great ways to use up your outstanding credit before the end of the year or if you need gifts for the golfer who has everything. Ladies’ Closing Day – Beat the Pro will be held on October 1, with the 18 hole ladies teeing off at 9:30 and the 9 hole ladies teeing off at 11:00. Men’s Closing Day is October 10 and the signup is posted in the Golf Shop with all of the details. This is the first official Players’ Cup point event for the 2016 season so don’t miss out. Octoberfest three club scramble October 17 – Tee off by 10:00 AM. There will be a pot luck for everyone to enjoy and participate in throughout the lunch hours. Each player will be allowed three clubs to help the team in the scramble, the team may share clubs on par 3s. We will see a lot of players walking October 11, 12 and 13. California University of Pennsylvania will be hosting their “Vulcan Invitational” at Lone Pine which will close the course down partially on the 12 and 13. This is another great opportunity for exposure as we will have some excellent collegiate golfers representing their schools. I invite anyone that would like to watch some of the play to come out and enjoy. October 22 Lone Pine will be hosting an event for Linsly which will have the course closed for the day. September was a great month for golf with many days above average in temperature. The Player’s Cup ended with the Blue team narrowly defeating the Red team but all the participants ended as winners. This year participants played for nearly $3000 in shop prize money with everyone that played getting at least $75 as a thank you for participating in the season’s events. The Tour Championship Better Ball proved to be a success again this year with twenty participants. Again I can’t thank you enough for all of your patronage this season. I will see you at the club. 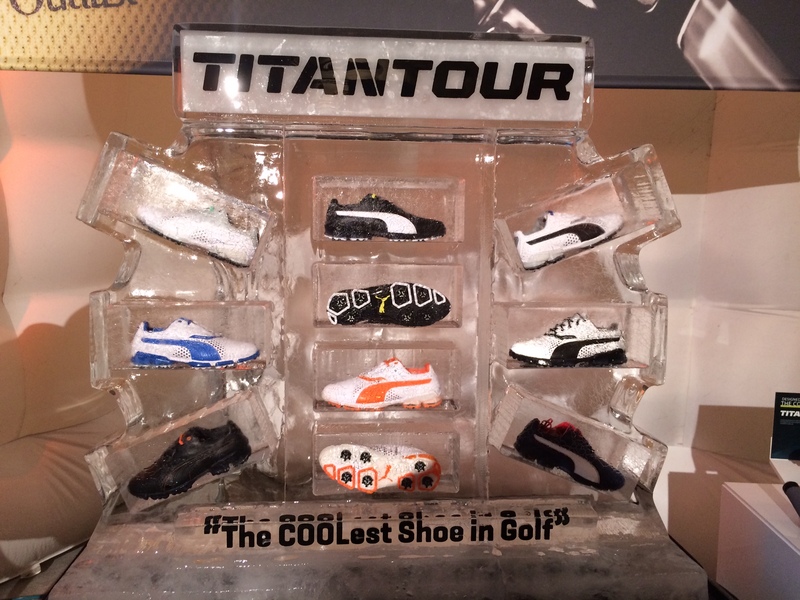 The temperatures may be cooling down, but the golf season is still hot. We have lots of events left to finish out the season including Labor Day, The Player’s Cup, Tour Championship Better Ball, and Closing Day. Our newest event to be added to the calendar is the CO-ED “MIXED” INVITATIONAL. It has taken the place of the September Stag and is open to all members and their guests. Teams may be all men, all ladies, couples, mixed, or any combination. It is build like the stag which is all inclusive. $75 per member, $95 per guests and includes golf, cart, prizes, lunch before golf, a strolling feast and beer tasting after golf. Please call to hold your spots as spaces will be limited. Chef Duane has been creating pairing with Jordan and the rest of the Culinary crew. The food is sure to please and Jordan’s knowledge of craft beers is extremely fun and educational. The Lone Pine Cup Matches will be finishing up over the next month and I want to remind everyone to stop in and pay your entry fee if you have not done so. If you are not sure, we have the list of everyone who has paid. 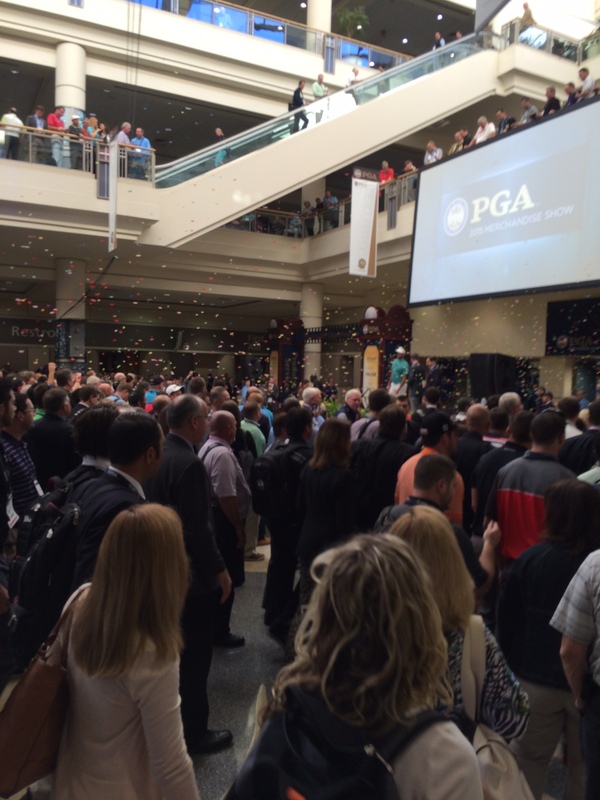 Labor Day is the last point event of the 2015 season before the Players Cup. We will be playing a best 3 of 4 at 100% handicap at 9:00am on Monday September 7th. You may make your own foursome, but if you do not have a team, sign up as an individual and we will be glad to help pair you with a team. You should definitely be aware of the calendar for this month, as we do have some events which will cause some closings and course restrictions. September 10 we will be hosting the ACCA outing which will not close the course, but it will cause some tee restrictions as we go through the day. September 11 is the Lone Pine Bandits party. If you are part of the bandits and have not signed up, please contact Frank Dobbin to get on the list. 9:00 Shotgun and lunch to follow golf. September 13 we will be hosting the Elks which will close the course until approximately 3:30. September 16 we will be hosting the Tri-State PGA for the Assistant’s Championship. The course will not be closed, but we are asking that you call in for tee times to help everyone enjoy their rounds. As we see things begin to wind down, you will see some specials being offered in the shop. Currently we have Titleist perma-soft and Callaway tour gloves available at 2 for $35 or 3 for $45 (you may mix and match the two brands and sizes). We are also working on our merchandise mix for 2016 and I am very excited to say we will see some changes for next year. Some new brands and styles which mean we will be eliminating some of the regular staples from our current mix. We will still have accounts with all of the brands enabling us to do special orders. I look forward to seeing you all at the club. July was a little wet to start, but it ended with hot and humid days like we are accustomed to in Western Pennsylvania. With the improved weather, the Men’s Match Play was able to get underway with only a few more matches to play to determine the Club Champion for each respective flight. The Fourth of July Red, White and Blue Men’s Event had a new team of champions this year as Dunn, Helfer, Zinsser and Elliott shot a 23 under par 121. The teams of Phalin, Phalin, Dziak, Haines and Calabrese, Aftanas, Songer, Johnson tied with a 21 under 123. Fourth place team was comprised of Markey, Markey, Falosk and Ward with an 18 under 126. The Vernon C. Neal Senior Club Championship and the Medal Play Championship were both held on July 11. Mike Gasper shot a 1 over 109 for the 27 hole Medal Play event with Jeff Dunn, Jason Wilson, Eric Belleville, Andy Carrigan Sr., Andy Carrigan Jr., and Tony Aprea all qualifying for the Championship Flight of the Men’s Club Championship (Match Play Championship). The 2015 Senior Club Champion is Randy Markey who along with John Mark Hunter shot 81 under the tough conditions. Mr. Hunter grabbed low gross honors for the 54-59 division with David Haines winning low net. Joe Meneskie fired an 82 to win low gross in the 60-64 division with Gary Froelich winning low net with a 77. Rick Christy also shot 82 to grab the top spot in the 65-69 division and Dave Brendel won low net with a 68. Butch Richmond won the 70-74 division with his 82 while George Rose fired a net 67. In the 75-79 division, Tom Whalen had a 98 for low gross honors and Frank Larimer had a net 71 for the low net. The Super Senior Club Champion was George Mondik with a 95 With Carmen Mastandrea and Jack Elliott winning their divisions for gross score. John Pirris and Chick McIlvaine won the low net. Thank you to everyone that participated in both events. The Inaugural Brother Man Classic was held on July 12 where participants competed in a Variable Better Ball, Chicago (modified Stableford/Par Quota), Better Ball of Partners, and a skins game. This will become a regular staple on the calendar moving forward into 2016 and beyond. The date is not set, but we will have it on the calendar of events. Finally in the month of Championships, Trent Belleville won the Junior Club championship by a narrow one stroke margin over last year’s champion Jake Orr. Great playing to both of you and I look forward to seeing many more exciting matches in the future. August will play host to a few outings including the United Way outing on August 3rd. FCA in the afternoon on August 4th and the Elaine J. Reihner Memorial golf outing on August 6th. The August Stag will be held on the 12th and our August Hit and Giggle will be on the 22nd. The Men’s Labor Day Event will be held on September 7th, Players’ Cup September 19-20 and the Tour Championship Better Ball on September 26. September Stag 23rd. Sign up by stopping in or calling the golf shop. June was a very wet month, but it did have some moments of outstanding golf sprinkled in between the rain drops. The Western Pennsylvania Golf Association paid us a visit as we hosted one of the qualifiers for the West Penn Amateur. The course proved to be a true challenge with only four players breaking par. We received rave reviews and we have been asked to host the U.S. Senior Amateur Sectional Qualifier for 2016. This is a great honor as we are quickly becoming a regular stop for the W.P.G.A. which gives us exposure to some of the best players in the area. It is a testament to the quality we are all enjoying thanks to the hard work of Brian and the Grounds Crew. The LGA had their Grandmother’s Tournament on June 11th with Linda Vivian besting the field with a net 73. Jean Lehman came in second with a net 74 and there was a tie between Carol DeSimone and Gail Balent both having net 75. The Parent Offspring grew a little this year, however it is still a far cry from the size field I hope to see in the future. This year we did have the addition of a Mother Son division with Lisa Steele and Zack Steele grabbing first place. In the Father Son Division Mike Calabrese and Dylan Aftanas claimed the top spot with Joe Meneskie and Sam Dinka coming in second. The Men’s Invitational was a great success and I was told by several participants that this was our best Invitational to date. It ended with a three way tie heading back to hole 16 for a sudden death playoff where two teams advanced to a chip off due to weather. Marty Valentic and Brian Baker edged out Bob Efaw and Jeff Kiley to grab the title of 2015 Men’s Invitational Champions. July is lining up to be a very busy month with the Fourth of July Men’s Event, Medal Play Championship July 11, V.C. Neal Senior Club Championship July 11, Match Play Championship, Jr. Club Championship July 25, and several outings which will cause some restrictions and closings to the club and course. The Washington County Chamber of Commerce will be celebrating their 15th year with us on July 10th. The course will be closed until approximately 2:30 and the Grille Room will be closed until 4:00. The Autism Open is returning July 24th which will also close the course until approximately 2:30 and the Grille will be closed until the Date Night dinner at 5:00. Thank you all for your understanding as we continue to work on ways to improve your overall experience. I look forward to seeing you all at the club. It is highlight reel time. May was a very busy month with Fitting Days, The return of the Member Member, Memorial Day, our first Hit n’ Giggle of the season, and our first STAG of the season. The fitting days were bitter sweet as it was exciting to see the professional staff and vendor reps give over 60 fittings over the two days, it was also John Rapko’s last week working in the shop. He is doing very well and looks forward to coming back to visit soon. The Memorial Day event was also a great success with 56 participants playing the Modified 2 of 4 format. While one members score was designated as having to be used, the other score was the best net of the other three. In the end only 15 shots separated the entire field. Dunn, Carrigan, Helfer and Allison won the event with a 12 under 132. There was a tie for second at 134 between the teams of Christy, Paluso, Dinardo, Brendel and George, Rhone, Oberst and Barthelmes and fourth place was held by the team of Parrish, Bennett, Phalin and Snee at 136. This Month we look forward to the Men’s Invitational. As the seasons premier event we strive to provide the best in everything we have to offer. From the food, golf, gifts and prizes to the entertainment created by the skills challenges it is a sight to be seen and not to be missed. There is still a little time to sign up, however there is a chance your tee gift will have to be received after the event due to the lead times required. The STAG on June 24 is the next best thing to the Invitational featuring golf and prizes which in the end are overshadowed by a dinner and beer tasting like no other. This is by far the best value for guest play whether you are bringing guests, playing with family, friends or coworkers. Call for details or to sign up. We will continue to hold our Ladies Workshops every Tuesday at 8:30am. The cost is only $10 per class and we will continue to work on ways to practice and truly improve your golfing ability. I want to end on a serious note. We are doing everything we can to continue to provide the best experience we can provide. In order to do this, we request your assistance in fixing ball marks, using the divot fill mix from the bottles on the carts, and finally to use caution when using the carts around the course. The carts are not be taken in to the naturalized grass areas around the course. Carts should be taken straight up and down hills and they should be driven on cart paths where available. We want everyone to have fun and to be safe when playing and we want to make sure that we keep the facility in top playing condition for anyone who may play the course after you. Thank you and I look forward to seeing you all at the club. May is here and with it we get into the full swing of the golf season, even though the weather makes it feel otherwise. 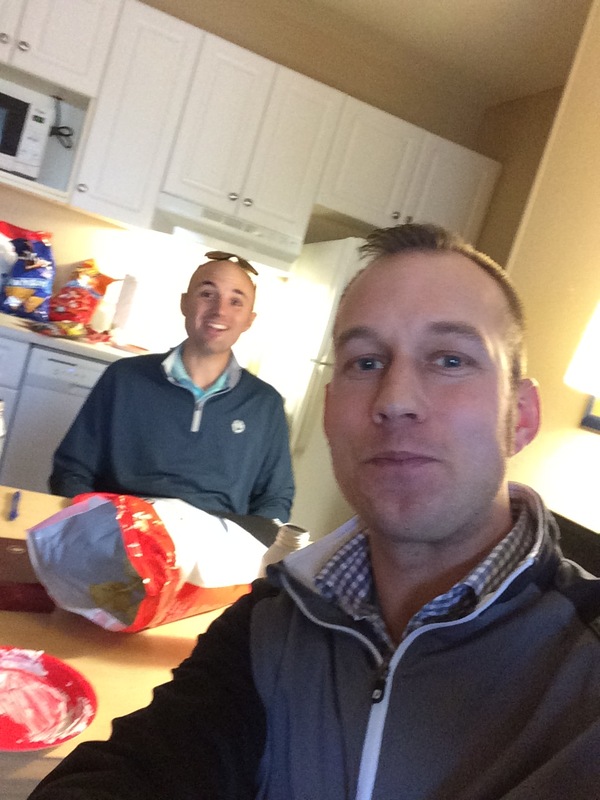 The kickoff to the season began this April with several LGA events including the Rules Workshop, Spring Meeting and 9 Hole Mixer, and the LGA’s Opening Day on April 23rd. The Bandits and Men have been teeing it up weekly since the first week of April and we had the official kickoff on April 25 with the Opening Day Scramble. Men’s Opening Day was our annual computer drawn team scramble with a weighted USGA scramble handicap. 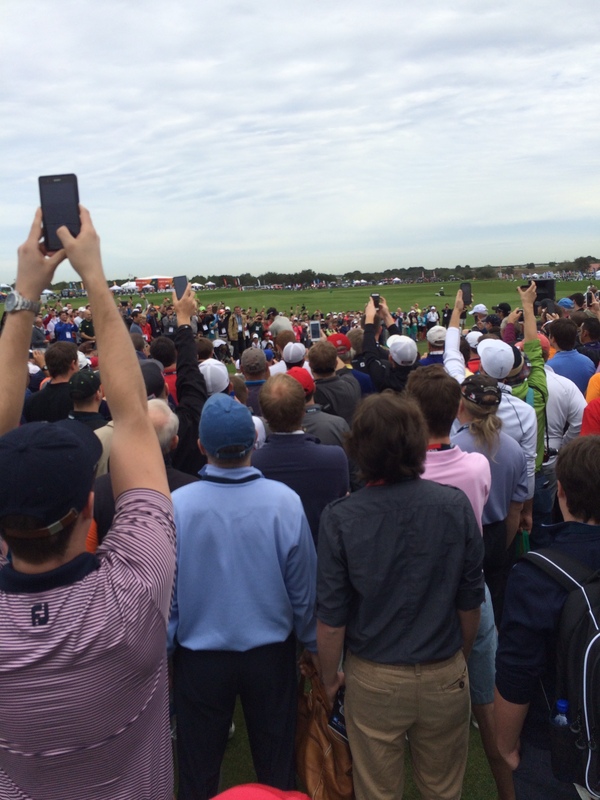 The format kept everyone in the hunt with only nine shots separating the entirety of the field. This year’s Champions are as follows with each of these teams receiving their participation and place points toward the 2015 Players’ Cup. Each player was given a Lone Pine Signature Tumbler for their participation in the event which entitles them to $1 refills on fountain drinks and coffee as long as they use their tumbler. The tumblers are made to accept a straw to help us reduce waste of Styrofoam cups throughout the year. Even if you did not participate, we will have the tumblers available for sale in the shop all season. We have many opportunities for members to participate in events this month including the fitting days May 2-3 from 1:00-5:00 on the range, the return of the Member/Member on May 16, our first STAG event of the year on Wednesday May 20, and the Memorial Day event on May 25, and the first Hit & Giggle of the year on May 30. The LGA has a weekly event every Thursday and we will be starting up the Ladies Golf Workshops May 12. We want to give you every chance possible to take part in our Player Development series which will not only work on how to play better, but to feel better and enjoy the game more. Invitational Signup Cards are in the Golf Shop, in order to guarantee your tee gift will be here for the event, we need to have all of your team’s information by May 15. If you would like to sign up, please contact the golf shop as soon as possible. The field is limited to the first 48 teams. Male Members of any classification (Social Golf, Social Dining, Full Golf, Intermediate, Limited Golf, and Super Senior are eligible to sign up. Reminder that guests must have a verifiable USGA handicap. April is finally here and it’s time to jump start this 2015 golf season. We have so many plans to help you play your best golf this year, including a totally new Junior Program featuring our “Junior Workshops” and an improved on course experience. We will be getting back to hosting our Ladies Workshops as well as introducing new opportunities for all of our members to get more out of their time at the facility. Sign Ups for many of the early events this season are available in the Golf Shop and Ladies Locker Room respectively. Our first Majors Tip Board is open for the 2015 Masters Tournament. Information, sign up, and rules are all available in the Golf Shop. Blocks may be purchased on account. The Bandits are kicking off their season Friday April 3rd with a spring meeting at 9:00am. We will be discussing rules then voting on some policies to keep play fair and equitable for players of all abilities. If you are interested in joining the Bandits or if you are looking to attend the meeting, please call the Golf Shop. The ladies will have their third annual Ladies Rules workshop on April 9th, we will be going out on the course as long as the weather permits. We will continue to use this time together to cover common rules situations and to address any questions you may have. This is a fun program and it is open to anyone in the LGA, Looking to join the LGA or guests of the LGA. The LGA will also be having a 9 hole mixer for their 9 and 18 hole players on April 16. If you are interested in joining the LGA this is a great time to meet the members. Ladies Opening Day is April 23rd as we officially kick off the season. See the sign up for these events in the Ladies’ Locker Room. The Lone Pine Cup (season long partners match play) sign up closes on April 25th. Please call or stop in for information or to sign up. April 25th is also Men’s Opening Day, our signature Computer Draw Scramble. Opening day will tee off at 9:30 and all participants must sign up by 1:00PM Friday April 24th. This is our first point event for the end of the season Players’ Cup event so make sure you sign up early to avoid being left out. FITTING DAYS! May 2nd and 3rd from 1:00-5:00 on the range. Don’t miss this opportunity to hit a lot of the new products we carry, and to go through a full free fitting to make sure you have the right equipment for you. This is a new approach to “DEMO” days by hosting PING, CLEVELAND, and COBRA all on property Saturday May 2nd. We will load up Sunday with TaylorMade, Callaway, Tour Edge, and Adams. The signup for fittings are in the golf shop and we are setting aside 45 minute blocks of time to work directly with you on equipment, technology and technique. Finally, along with your April Newsletter, you will find your 2015 Men’s Invitational letter. We have lined up great entertainment, food, golf, and gifts which are explained fully in the letter. It is still limited to the first 48 members and their guests, so make sure you put your entry in early. The sign up cards are in the golf shop and the event is open to all male members of any classification. I can’t wait to see you all at the club. March is a very exciting time for the club. The renovations have been completed with only some polishing and finishing touches to go. The rearranging of the bag room has also been completed which should allow us to better serve the members when staging bags for play and for cleaning clubs after your rounds. The addition of the pump house will allow for aerating of the greens to happen nearly six weeks earlier than what we could previously attempt. All of these improvements help us to achieve the goal of providing an exceptional experience for everyone that uses the facility. I am looking forward to the upcoming social events we hold at the club as we wait for the weather to break. The wine tasting and St. Patrick’s beer tasting are great opportunities to expand your knowledge of premium adult beverages while taking in the beautiful newly renovated ball room. Please call to get the most up to date information on these events and be sure to follow us on Facebook and Twitter to get information on course conditions, frost delays and reminders for upcoming events. The Professional staff returns in full force this month to finalize the player development programs (clinics and lessons) we will be running throughout the year. The arrival of our spring orders will begin late this month and continue into early April. We also look forward to having Tim back to oversee the Men’s and Ladies’ locker rooms. He is available to keep you looking your best on and off the course with shoe strecthing, polishing, cleaning, and re-spiking. Kyle has added to the services we are providing with your bag storage. Over the last month he has updated the bag tag information of every bag in storage and he has added shaft labels with the member’s name, club name, and club phone number. If you would like to have shaft labels printed and put on your clubs, please contact the golf shop. If you have bag storage, this service is included and we will get them on all your clubs when you sign up or bring your bag back to store. The Bandits will have their Spring meeting and golf event (weather permitting) April 3rd. We will be meeting in the Grille Room at 9:00AM for breakfast and to vote on some ideas for the Bandit’s season. 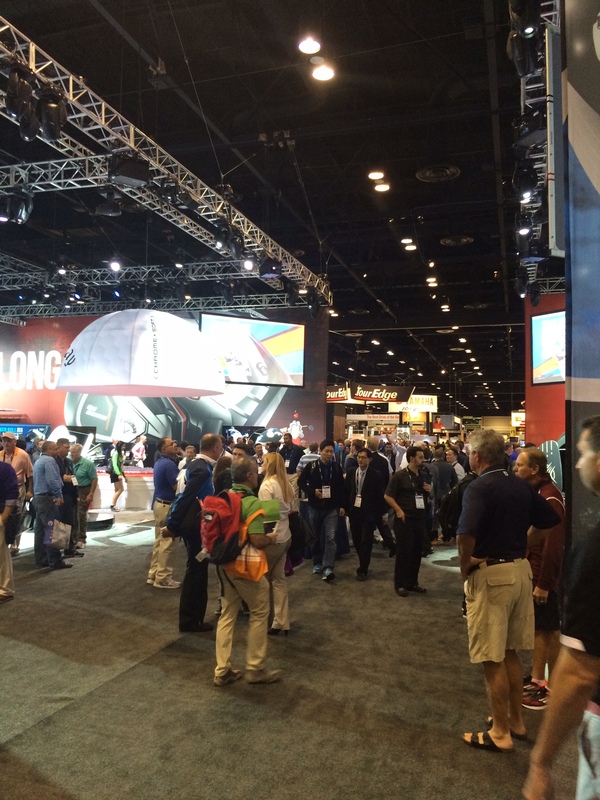 We ask that you call the golf shop to let us know you will be attending and if you plan to golf. This will help chef know about how many to expect and help the professional staff stage a great kickoff event for 2015. Our Fitting Days have also been scheduled. I am waiting to hear back from a couple companies but we already have Cobra, Ping and Cleveland confirmed for May 2nd 1:00-5:00. We also have Callaway, TaylorMade and TourEdge coming on May 3rd from 1:00-5:00. Please call to schedule a time with one of the professional staff to take advantage of our free clubfittings. This event is open to Members and non-members, so if you have friends that are looking to make changes to their equipment this is a great opportunity. We are setting aside half hour blocks to make sure we get the right equipment for you to have your best season yet. The 2015 Lone Pine Cup, Men’s Opening Day, Ladies Rules Clinic, and Ladies Spring Mixer sign ups are posted in the Ladies Locker Room or Golf Shop respectively. 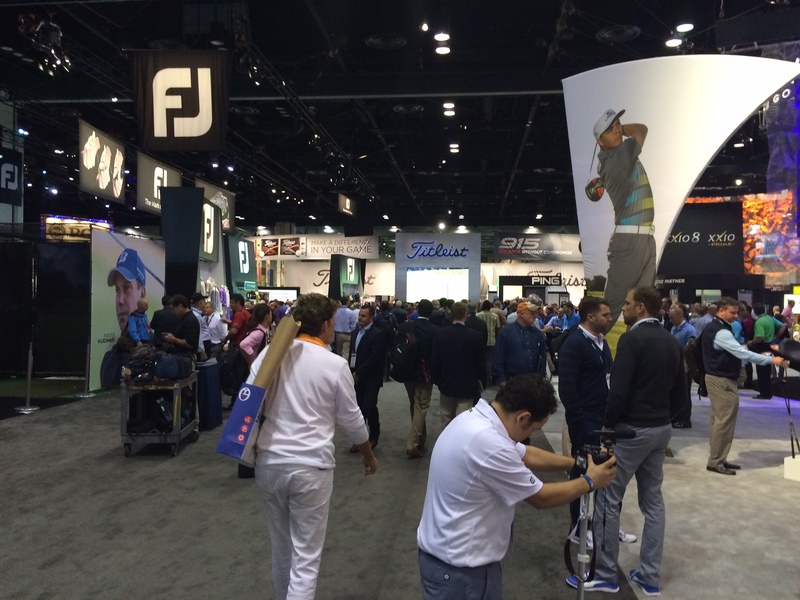 The participation last year was outstanding and I look forward to seeing you all at the club’s 2015 events. We are here to provide you with an exceptional experience in all areas of the club. Using the bag drop, Locker Room, and bag storage will help us to provide you with “The Lone Pine Experience”. We appreciate the time you choose to spend with us and we want to show our appreciation through the service we provide. Thank you all and I look forward to seeing you at the club. Congratulations on your new position as you take on the role of First Assistant Golf Professional at Wannamoisett Country Club in Rhode Island. Although this takes you farther from your home, you are paving the way for a bright future as a leader in our industry. Good luck in everything that you do, and remember you have friends ready to help anytime you need it (not that you will). 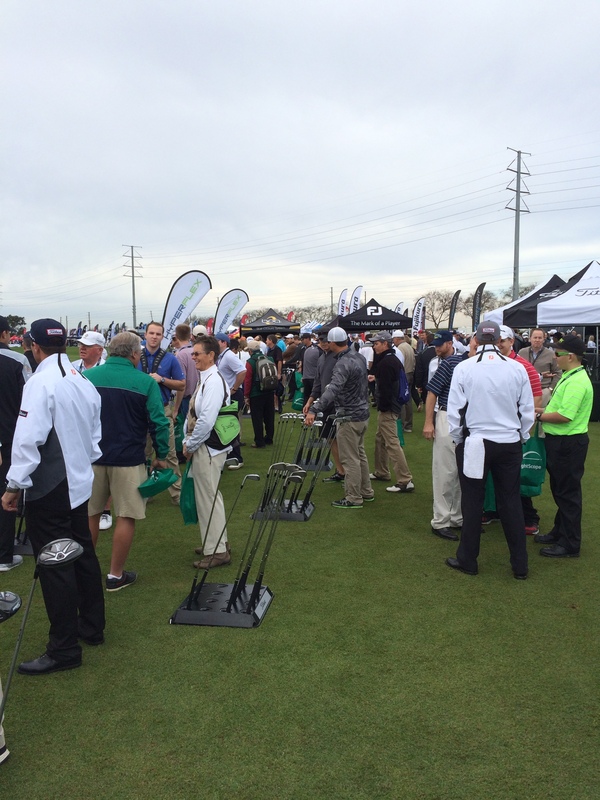 My time at the show started with a trip to Tuesday’s Demo Day. A 360 degree range that featured pretty much every manufacturer, launch monitor, and shaft company with an endless supply of range balls. Technology is incredible and I am very excited to be putting some new equipment in play for 2015. Wednesday started early to see the opening. 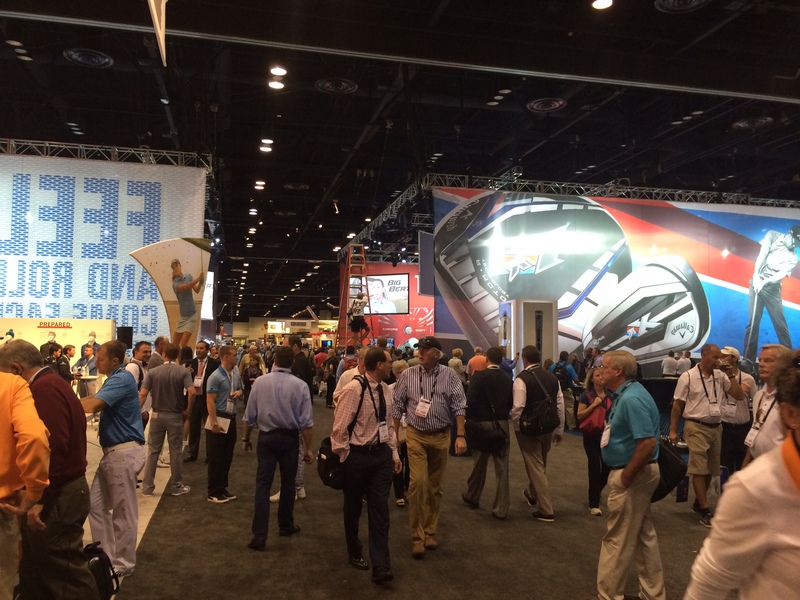 I had the opportunity to talk with several PGA Professionals from our section including Jim Antkiewicz, John Klinchock, Chris McKnight, and Chris McGinnis. 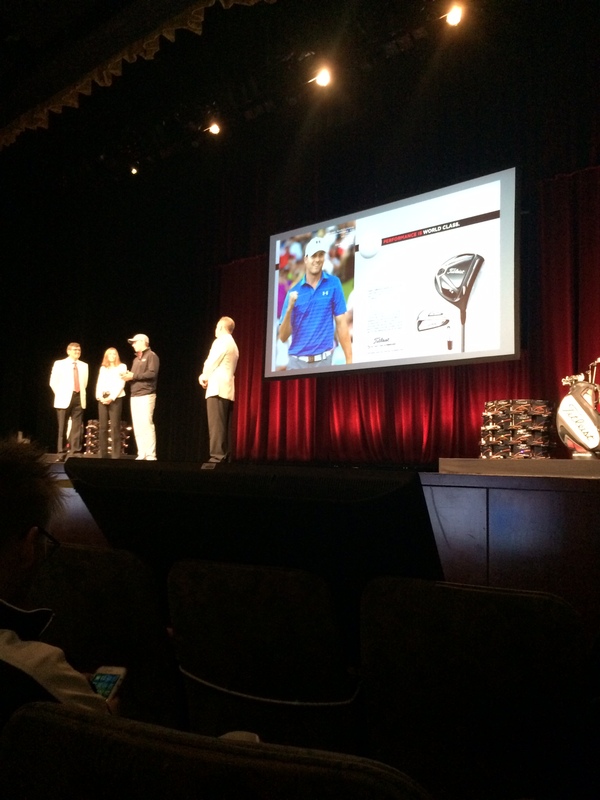 Bubba Watson joined the team on stage and we began our first day of meetings and seminars. 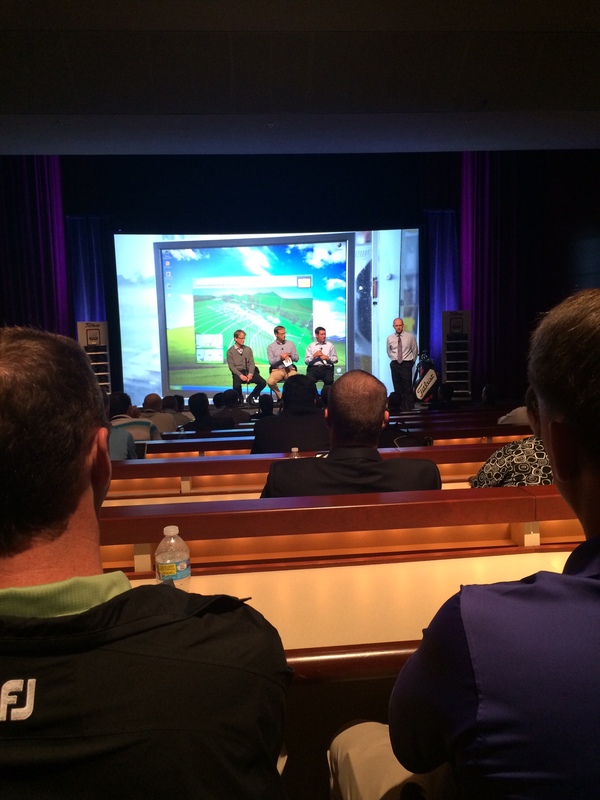 My first stop was to the Titleist kickoff with Jordan Spieth and some very intelligent folks from Titleist. It was a wonderful presentation about the new Pro V1 launch, 915 metals and the partnership we have had as PGA members with the Titleist brand. 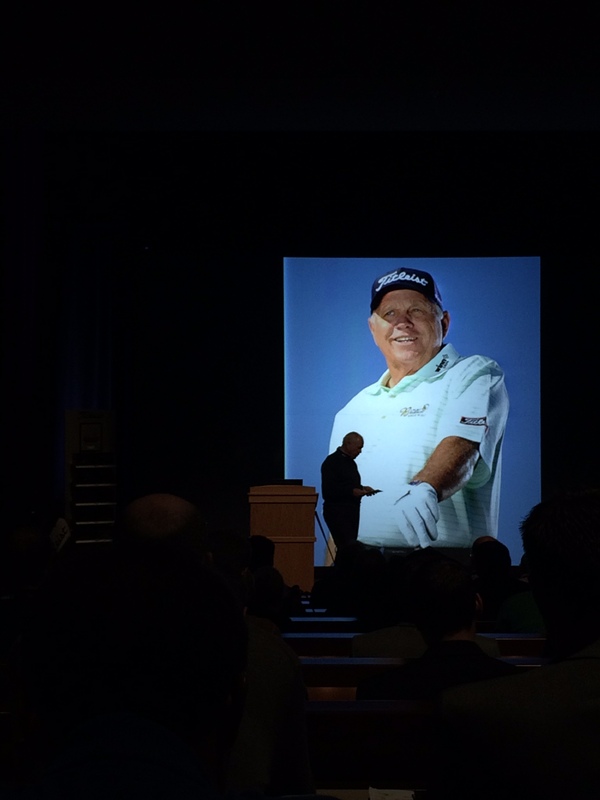 Next to meetings with Greg Norman and Certifresh Cigars followed by a fantastic seminar about the technology behind the Titleist 915 metals family. After a couple more meetings (Cobra/Puma Golf among others) I had a seminar on developing talent with three of the greatest coaches in the game. Claude Harmon III, Cameron McCormick, and Mark Blackburn. 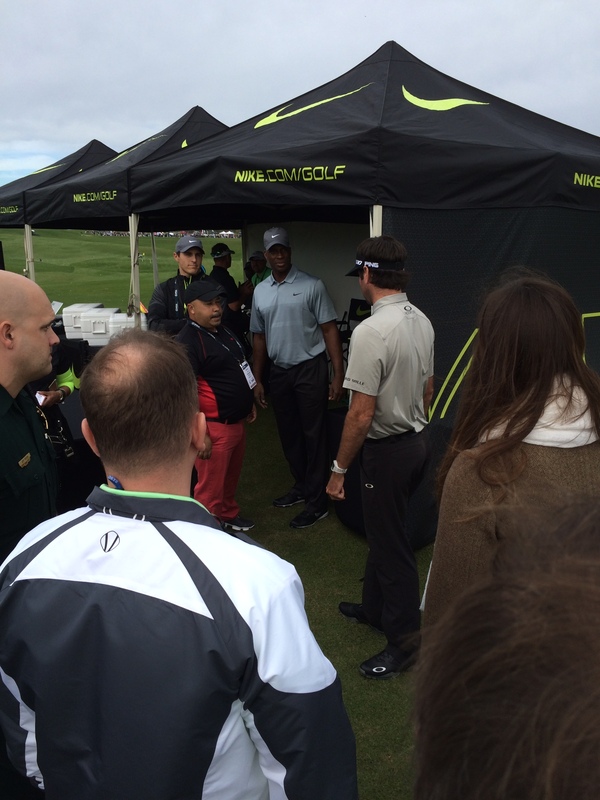 We are definitely beginning to shift gears in the teaching aspect of the golf industry. Moving much more towards coaching and not just instruction. The seminars were almost as much round table discussions as they were presentations. The questions were outstanding and the amount of knowledge held by everyone in the room (not just on stage) was humbling to be a part of. My day finished with a couple short meetings and several miles of walking the show floor before heading back to the hotel to change, dinner with Justin Barroner from California University’s PGM Program and Joe Merlin a Professional from a top 50 facility (not to mention friend, colleague, peer and classmate). Thursday was light on meetings but heavy on seminars. The three that I attended included a wedge clinic with Bob Vokey and Aaron Dill, Putting with Scotty Cameron, and “In the Lodge” with Butch Harmon. As proficient as I am with wedge fitting, hearing first hand about the design qualities, bounces and grinds from these two gentlemen was enlightening. Scotty Cameron began working with a milling machine in his parents garage at the age of nine and has dedicated his life to creating the finest putting instruments in the game. 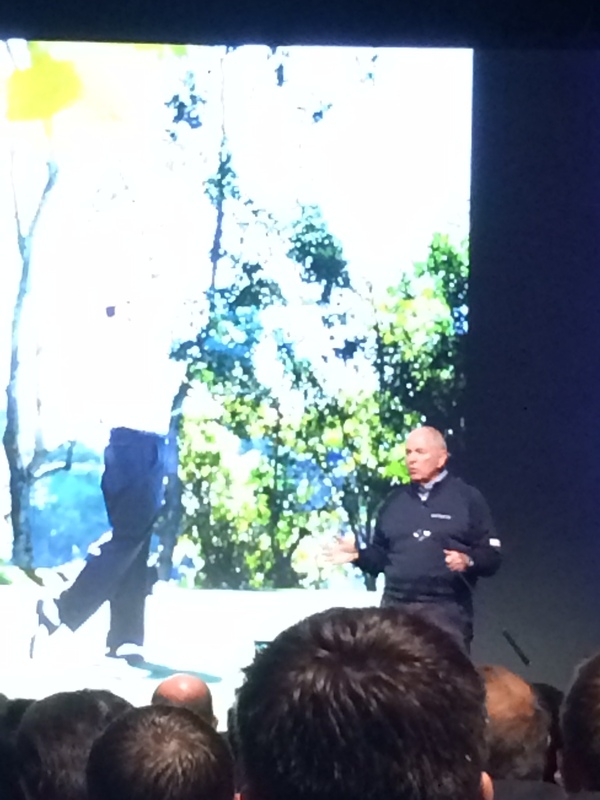 I don’t have words to describe what it was like to listen to Butch Harmon talk about his experiences and his approach. It was an astonishing day at the show followed up by dinner with a couple very good friends and a few professionals form top 100 courses. Friday is the short day at the show wrapping up by 3:00 but not before seeing Billy Burke at FootJoy and our new representative Brendan. 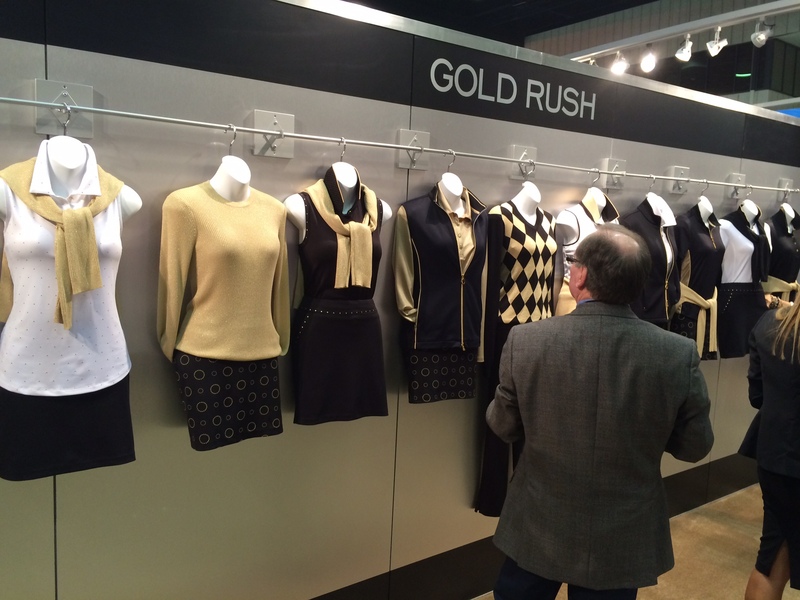 An hour breeze through the fall lineup then a walk around the show floor. Last stop before lunch came from a meeting with Lou our Adidas representative and a tour of the fall lineup for Ashworth. 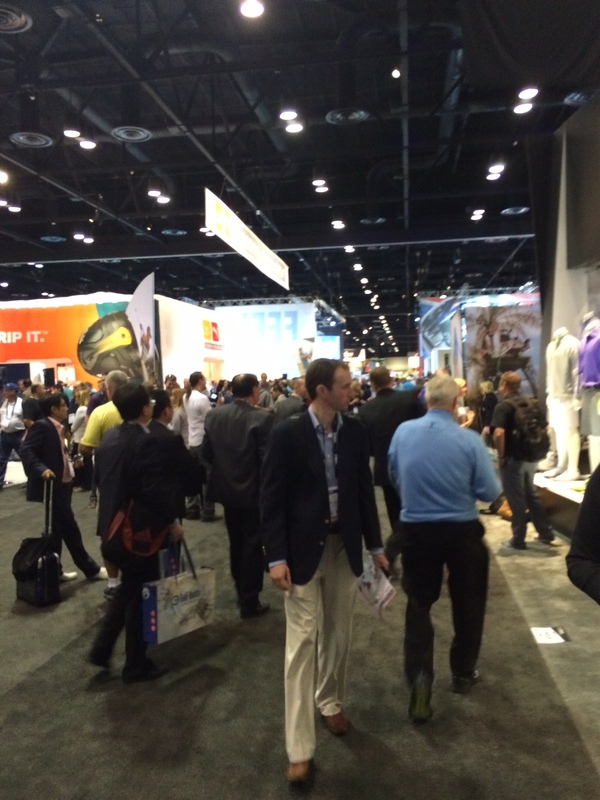 Lunch and a final walk around the show floor to haggle and talk with vendors before rolling to the hot tub to soak. In the end there were nearly two marathons walked over the 5 day trip and I am definitely a better person and PGA Professional for it.